Are We Missing the Most Important Aspect of Health Care? Danielle Ofri was confused the first time she heard the term ‘expired.’ The first-year medical student envisioned her family’s shabby air mattress used for camping trips in the Catskill Mountains. The revelation took a moment. Now a veteran physician at New York’s Bellevue hospital, Ofri laughs at her earlier ignorance. Language, and more importantly communication, is at the center of her new book, What Patients Say, What Doctors Hear (Beacon Press). 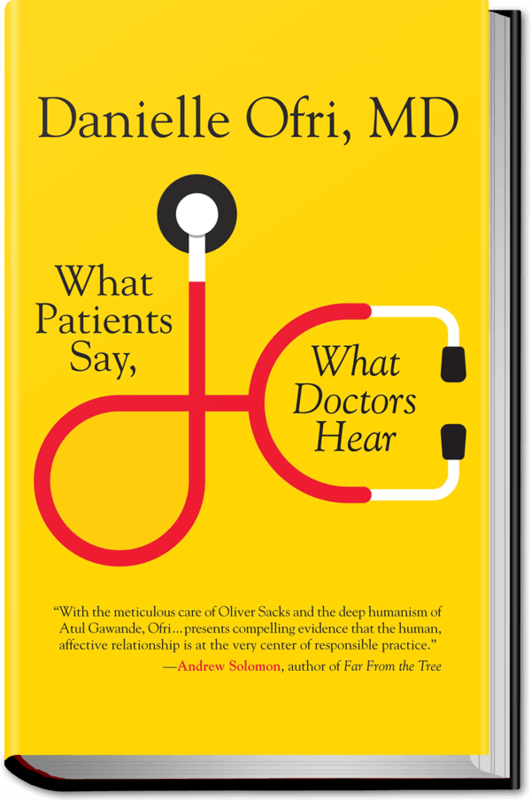 How doctors and patients interact plays a greater role in medicine than we might believe. As the medical industry strives for a virtual world in which diagnoses are made and prescriptions rendered on a smartphone app, Ofri argues that successful conversation is the primary driver of healing. Sadly dialectics remain a longstanding elephant in the office: doctors enter with opinions, patients their own, the ticking clock on the wall in plain view of both parties. This creates resentment in the patient, who, as it turns out, is interrupted by the doctor within twelve seconds on an average visit. Likewise the physician quickly grows impatient due to noncompliance: 50-75 percent of subjects do not adhere to physician advice. A vicious cycle commences in which neither side feels heard. Healing becomes difficult when anxiety rests at the foundation of this relationship. This particular exchange is often fraught with problems from the beginning. A perpetual fear of litigation on one side and long wait times and snap judgments on the other create an insurmountable gulf. Marriage counselors recognize that by the time a couple seeks guidance it’s often too late. No comparable therapy exists for a patient that wants to break up with their doctor (or vice-versa). Yet this mysterious distance is avoidable. Ofri writes that talking through emotional challenges alleviates tension for both parties. When physicians avoid the psychological and emotional aspects of illness the risk of nonadherence to medications triples. Factor in particularly stressful situations—unemployment, housing issues, romantic quandaries—and that risk is six-fold higher. An inability to quantify conversation seems embedded in a system in which blood pressure and cholesterol levels are promptly displayed. But it’s not. One Canadian study showed that electrical stimulation for back problems resulted in a 45 percent reduction in pain. The other group received a sham treatment but talked extensively with their therapist. The result was 55 percent pain reduction. Ofri’s narrative is not factual alone. Her personal experiences of bias, uncertainty, fear, and confusion are woven into the fabric of this challenging tale. She openly discusses her unconscious intolerance of obesity, avoidance of junkies, ethnic favoritism, the sheer emotional and cognitive magnitude of dealing with death and suffering on a daily basis. In the process she humanizes her profession, an essential step in reversing favoritism and bigotry in hospitals and clinics. Delivering a death sentence, Ofri promises, does not become easier with practice. She’s broken down in tears on more than one occasion regardless of how together she tries to remain. She’s misread charts on long shifts and missed clear signs of domestic abuse. For an entire year she never realized one particularly challenging patient who never took the proper medication was illiterate. Yet she argues that you can’t be a good doctor with a lousy bedside manner. Empathy matters. Spending six figures on an education makes some feel mighty, though research knocks such an attitude down. A study conducted at Waterbury Hospital in Connecticut revealed that while 73 percent of patients knew they had one primary care doctor during their visit, only 18 percent could name them. Incredibly, two-thirds of doctors believed their patients knew their name. What if expectations shift? One of the most illuminating aspects of Ofri’s book is that expectations can be as influential as medication. The placebo effect works on such a premise. What we believe about a drug or doctor can actually block the biological effect of a pharmaceutical. This knowledge potentially shifts the patient-doctor relationship—so long as both parties recognize and act as if they’re in a relationship. Which of course requires empathy. Ofri’s most potent revelation resides in its simplicity: the patient is not the same as the illness. In one racially-motivated study nurses offered less pain medication to African Americans than to white patients when instructed to use their best clinical judgment. When told to envision how pain affected their patients’ lives, dosages were more judicial. When they imagined feeling their suffering nurses complied with the Golden Rule. My watch is currently telling me to take a minute to breath. Soon it might send my vitals to the team at UCLA, which would then text me should they notice worrisome discrepancies. A refill, diagnosis, even a kind word about my day might follow. Yet it could never replace the pantomimes and personality of a real human being. As Ofri argues in her insightful book, this remains the most important aspect of medicine.